All of us at Kansas City Party Bus would like to extend you a very warm welcome! You wouldn't be here if you weren't planning an exciting event in the area, or perhaps you're just new to the concept of renting a party bus and you're trying to come up with a reason to rent one! In any case, our website will provide you with plenty of ideas about party bus events, tips on how to save money when booking a party bus with us, and of course all the information you need on our fleet of vehicles and our complete service area. If you're new to the party bus experience, you should know that when you rent a bus from us, you are treated to a completely different level of class than you are with other local companies. We hire only pro chauffeurs, never just licensed drivers, so you are truly given a memorable experience (and a safe one!) on the road. Plus, there's never any reason to worry about traffic, about driving while intoxicated or having a designated driver, or even finding a parking space! We're very excited to hear from you and begin planning the party bus trip of a lifetime, so just give us a call at the number at the top of this page or shoot us a quick email. We also have several other transportation vendors we recommend in other areas. 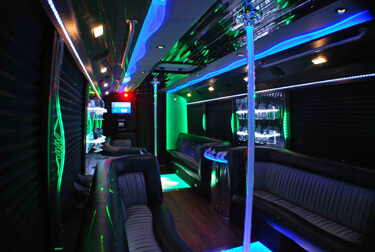 In California we recommend Sacramento Party Bus and Party Bus San Diego. To the north of them we recommend Seattle Party Bus and Portland Party Bus. In other areas Miami Party Bus and St Louis Party Bus are great. 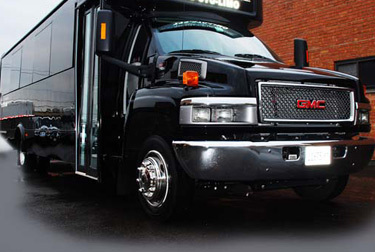 For the Midwest, you should go with Party Bus Chicago and Party Bus Detroit. Party Bus and Limo companies! Check out this great party bus for sale! ...and HD antennas to pull in true live HD broadcasts while the bus is parked! Built-in bars for the wannabe bartender, just bring your own alcohol, we provide the ice, cups and paper towels! Listen to CDs or just hook up your iPod!